It was my freshman year of college. I rose ridiculously early (for a college student) in order to go with a friend to the non-denominational sunrise Easter service at the Lincoln Memorial. We sat on the steps of the memorial and sang “Because He Lives” as the sun rose over the city. Climbing down the steps and making my way back to campus, I met up with a friend who was taking “Introduction to Eastern Religion” with me, and we headed off to meet our class at a Buddhist temple. Easter Sunday happened to fall on the day of an important Buddhist festival that year. We met at the temple, took our shoes off and spoke with a monk who shared with us about his faith tradition. We walked through the bazaar outside the temple, and the air was filled with celebration. Later that evening that same friend asked me to attend Catholic mass with her where we sat in a packed cathedral. I was struck with how this massive crowd of people acted as one in every form of the liturgy. Then, I went home and slept. It was one of the most memorable Easter Sundays of my life, and I remember it with joy. Easter joy. New life, new relationships, new knowledge, new experiences. God was moving through these experiences in order to shape and transform me. I recalled this special day after our recent ecumenical service with St. Pius X Catholic Church. 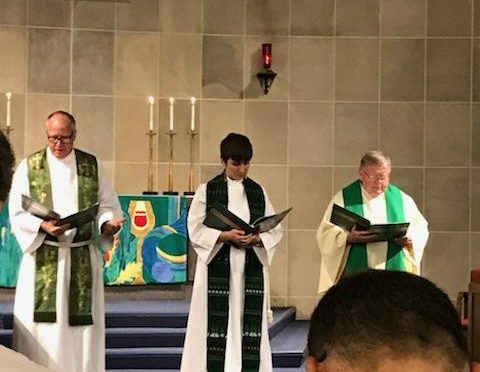 Commemorating the 500th Anniversary of the Reformation, we ate, shared, sang, and prayed together. We turned towards the future, as siblings in Christ, with hope. God was moving through these experiences in order to shape and transform us, reminding us that God calls us to be the Church together. As mentioned on that night, the two “ecumenical imperatives” given in the “Declaration on the Way” (a statement of Lutheran-Catholic dialogue) provided a good rubric: begin with where we find unity and know that we will be transformed by that encounter with the other person. It struck me that these were good imperatives for any encounter with others. God calls us to live in radical openness to “the other” – whomever the other may be: Catholic, Baptist, Methodist, Buddhist, Hindu, Muslim, agnostic, atheist and beyond. We will find points of unity, and we will certainly be transformed by our dialogue. I was transformed by my encounters on that Easter Sunday. As time presses on, moving us away from the joyful experiences of our ecumenical service, I hope we will continue to seek for new opportunities to share with one another. I hope that each of us will continue to partner and share with our siblings in Christ, as well as seek to encounter with openness all whom we meet, such as with the many Bhutanese neighbors around our church and in our neighborhoods. My hope is that God will transform us through new encounters, as we were changed on Wednesday night.